If you have ever had dental work done to your teeth, you are probably familiar with a dental filling. As one of the most common dental procedures, a filling removes decay from the tooth before it reaches the tooth’s inner chamber, preventing infection of the tooth’s pulp and nerve. But is there any chance of decay after a tooth has been filled? Find out with help from your Westland, MI dentist at Carey & Aylward Dental. When decay forms on a tooth, it eats away at the tooth’s outer enamel. However, cavities do not always hurt. A toothache only occurs when decay eats far enough into the tooth to infect or damage its inner pulp and nerve. The resulting infected pulp and nerve require root canal therapy, where the pulp and nerve are removed from the inside of the tooth altogether. When the decay is still at the outer layers, your Westland dentist removes it with a dental filling, leaving the pulp and nerve in tact. Do I have to worry about cavities after a filling? Yes. Just because a tooth has been filled does not mean that decay cannot still form afterward. 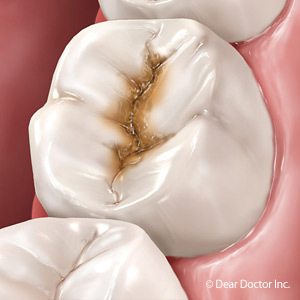 Tooth decay starts from the outside, with bacteria turning into plaque, a sticky substance which sticks to your teeth. If this plaque is not brushed away, it turns to decay-causing tartar. This is what makes brushing and flossing twice a day so important to the health of your teeth. What can I expect from the procedure for a dental filling? A dental filling is a fast and easy procedure which usually takes around 30 minutes. First, your dentist numbs the area of the tooth. Then, he or she removes the decay using a dental drill. Thanks to the local anesthetic, this is painless. A filling material fills the hole made by the drill. The filling is then shaped to fit your bite correctly and checked using transfer paper. If the filling is too large to stand up to everyday activities on its own, your dentist may recommend a dental crown to strengthen it. For more information on dental fillings and cavities, or to speak with an associate about scheduling an examination or cleaning, please contact Dr. Dennis E. Aylward, Dr. Brent L. Carey and Dr. Allison A. Carey at Carey & Aylward Dental in Westland, MI. Call (734) 425-9130 to schedule your appointment today!